Do you or someone you know have cataracts? New flexible and injectable intraocular lenses have revolutionized the science of vision correction at cataract surgery. These new microscopic lenses, miniature miracles no bigger than the width of a pencil, can be permanently implanted inside the eye through a clear corneal microincision, an opening smaller than 2.5 millimeters. Because the lens is flexible it can be implanted without sutures, without injection anesthetics and without the need for bandaging the eye. 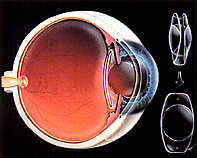 The lens will not wear out or require replacement and once removed, the cataract cannot return. America's baby boomers are aging. With age comes poor vision due to cataracts. It all starts at the age of forty when the need for reading glasses occurs, a condition known as presbyopia. Further clouding of the natural eye lens decreases the contrast of images and blurs vision. For the millions of Americans who undergo cataract surgery annually, there is new hope for the aging eye. An innovative, implantable intraocular lens (IOL), which can replace the aging eye's cataract, can improve vision better than ever before. This artificial lens, known as the Tecnis Z-9000, manufactured by Pfizer, Inc. (formally Pharmacia Corporation, Bedminster, NJ) received FDA approval for use by ophthalmologists in the US last year. A microscopic optical device about the size of the end of a pencil, it is permanently implanted inside the eye in a brief, outpatient procedure at the time of cataract removal. What makes this lens different is it's ability to improve the contrast of images, particularly at night, according to Robert M. Kershner, M.D., F.A.C.S. 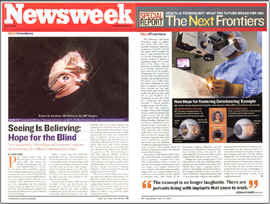 of the Eye Laser Center in Tucson, Arizona, the author of a study to be published in the Journal of Cataract and Refractive Surgery, The Tecnis IOL is an advance over existing technology due to its unique, modified, aspheric surface which restores vision to levels previously only seen in youth. A recent study, published in the August 21, 2002 issue of the Journal of the American Medical Association (JAMA), found that patients with cataracts who underwent cataract surgery and intraocular lens implantation had half the rate of automobile accidents during the follow-up period compared with cataract patients who did not undergo surgery. At the time of cataract surgery we can select the proper implant to correct your nearsightedness, farsightedness and astigmatism. The entire procedure is brief and without discomfort. See what people are saying about their cataract surgery with Dr. Kershner. For many people, these microscopic miracles can improve vision for driving, watching TV, bowling, or playing golf without the continuous need for eyeglasses. And age is not a factor! Almost anyone can enjoy clear vision, all you need is a desire to see better. Listen to what your friends are saying about their Cataract Procedure! The doctors at the Eye Laser Center, have extensive experience helping people just like you, experience greater comfort and clearer vision. The treatment for dry eye is simpler than you might think. And once you know how to eliminate this common irritation, life can become a lot more comfortable! The Eye Laser Center, Robert M. Kershner, M.D., F.A.C.S. and Chris M. Seniw M.D., M.S.F.S., provides you with the latest advances in vision correction procedures in addition to the medical diagnosis and treatment of all eye diseases. With over twenty years of success serving the Southwest, thousands have learned to trust and expect experienced and personalized ophthalmic care from the doctors of the Eye Laser Center. You can too, by simply clicking on the buttons or key words you see in this website. If you don't see what you are looking for, contact us. To learn more about Your Eyes, read Dr. Kershner's book, "Lessons From the Practice-The Gift of Sight"-A Guide to Understanding Your Eyes or view it by pushing the button Your Eyes. Meet Dr. Chris Seniw, specialist in eye microsurgery, Click Here. To Learn More About Your Eyes, Macular Degeneration visit Dr. Kershner to enter Consultation Corner. READ OUR MOST RECENT NEWSLETTER BY CLICKING HERE. Call US NOW (520) 797-2020 or Contact Us Through this Website! Interested in LASIK Laser Vision Correction? Question: What does this professional model; Troy Aikman, former quarterback for the Dallas Cowboys; Nicole Kidman, actress; and Tiger Woods, professional golfer, Have In Common? Hint: Over 3,500 People Do It Every Day! Answer: They are four of the over 4.5 million people in the U.S. who have had Lasik Laser Vision Correction for nearsightedness, farsightedness or astigmatism and have discovered the freedom of life without lenses. Are you afraid of Lasik, if so, listen to this! Delay your next vacation and take a vacation from your eyeglasses and contact lenses with LASIK! The Technology is better than ever before. If you've waited for the procedure to be "perfected", wait no longer. Most prescriptions can now be corrected with incredible accuracy to 0.25 microns! LASIK is NOT Expensive. If you've waited for the price to come down...wait no more! LASIK will not be more affordable than it is today! Contact us now for a complimentary evaluation at (520) 797-2020, tell us you have been to our website and receive a special pricing discount. We fully understand that price is a significant concern for our patients, as it is in any large purchase. It should not, however, be the primary determinant on whether or not to go ahead with laser vision correction. Unlike a vacation or a cruise, which is over in a matter of days, LASIK can provide a lifetime of benefits. Consider the savings in eyeglasses and contacts alone, not to mention the improved lifestyle and freedom! Whatever you enjoy, think of how much more fun you could have every day, without the burden of eyeglasses and contacts*. The time to achieve visual freedom is here! Listen to what your friends are saying about LASIK! Why Choose Doctor Kershner and the Eye Laser Center for Your Refractive Eye Procedure? In three words...reputation, results and experience. Dr. Kershner and staff have helped thousands of people, just like you, to see the world more clearly by providing the latest in vision correction technology for over twenty years in Tucson. Dr. Kershner, is a Clinical Professor of Ophthalmology, the author of over two hundred scientific papers and fourteen textbooks and has instructed other ophthalmologists in microsurgical techniques in the United States, Canada, Austria, Brazil, France, Italy, Norway, India, Mexico, China, Thailand, Japan, South Africa, Switzerland, Taiwan, Holland, Australia, Czech Republic and Russia. Dr. Kershner is among a prestigious few to be selected for inclusion in the 2002-2003 "Guide to America's Top Ophthalmologists" published by the Consumers' Research Council of America in Washington, DC. Dr. Kershner has performed over twenty thousand refractive procedures in Tucson since 1981 and is a pioneer in the correction of astigmatism with cataract surgery having authored a textbook on the subject. People from around the world trust their eyes to Dr. Kershner for his reputation and experience. Shouldn't You? The Doctors at the Eye Laser Center specialize in LASIK Laser Vision Correction, helping people just like you attain visual freedom for life! See for yourself, join us for a free consultation now! We are pleased to provide you with a comprehensive evaluation, answer all of your questions and let you see the benefits of LASER VISION CORRECTION for yourself without charge or obligation!